The Player may make large grandiose assumptions about Hollywood life, but who am I to argue against its claims? What I do know is that The Player showcases Robert Altman’s stunning directorial ability and him having fun. Because throughout The Player, there isn’t a grand sense of mystery or suspense – it’s just a really funny film that highlights what Altman can do with a large cast of characters. 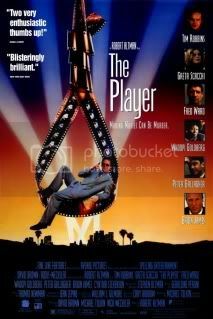 The title “The Player” refers to its central character, Griffin Mills (Tim Robbins). He’s a Hollywood executive who, from the onset of the film, listens to movie pitches. The scenarios are truly terrible, running the gamut of sequels to silly science-fiction. Throughout the pitches, you understand the value of sequels, the simplicity of undemanding material, and the need for stars (Julia Roberts and Bruce Willis seem to be Hollywood’s go-to-stars for insured profits). But Mills has a lot on his mind – for one, his profession is a dangerous one. Having a flop will end your career, and with a new hotshot executive named Larry Levy (Peter Gallagher) covering the area, Mills in on edge. To make matters worse, Mills is receiving threatening postcards from someone who pitched him an idea but never got a call back. When Mills finally discovers who is threatening him, he looks to rectify the situation. But he makes matters worse by accidentally killing the man, therein adding an extra burden to his life. But that’s where the film takes a most interesting turn. Altman establishes that murder is an inherently evil act, but that it’s not necessarily the greatest vice one can have in the Hollywood system. No, instead, failure to provide the studio with a financially profitable film is one’s greatest offense. But if you’re a proven money maker, then you’ll be kept safe. That sensibility is remarkably effective in giving the film its dark edge. The murder virtually becomes a secondary concern for Mills, who later becomes obsessed with toppling down Larry Levy and attaining the affection of a woman named June (Greta Scacchi). Sprinkled throughout the film are various cameos from Jack Lemmon, Elliot Gould, Anjelica Huston, Peter Falk, and others. Their appearances are done purely to establish the Hollywood setting. Part of the fun with The Player is seeing how the characters interact with the actual stars – it can be surprisingly funny. 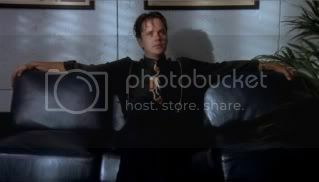 I’ve never been too impressed with Tim Robbins’ acting ability, and found his performance here to be adequate, if unremarkable. So no singular performance stands out, but as a whole, the film exemplifies Altman as a man who knows how to use his setting and characters to astounding affect.